The #IceBucketChallenge has overtaken my Facebook feed for close to a month now. Every time I log on, someone new accepts the challenge, a celebrity joins the cause, or someone discusses it. I typically grow tired of social memes or viral trends, but the #IceBucketChallenge hasn’t rubbed me the wrong way. In fact, I smile a little every time someone screams after cold water is dumped on his or her head. The ALS #IceBucketChallenge started as a way to raise awareness for ALS, also known as Lou Gehrig’s disease. The social campaign is incredibly simple. Once nominated, you have 24 hours to pour a bucket of ice water on your head or donate $100 to an ALS nonprofit. You have to post a video as proof that you completed the challenge and then you get to nominate three other people to do the same. It is a chain reaction, which has spread like wildfire. I was in high school when my cousin was diagnosed with ALS. At the time, I had no idea what the disease was, but quickly learned. ALS attacks a person’s nerve cells and leads to total paralysis. The worst part is that the mind remains completely intact, so you watch your body fall apart. Today, there are about 30,000 Americans who have been diagnosed with ALS. These people have to face the harsh realities of the disease, just like my family did. It’s no surprise that these are the people who are advocates and supporters of the #IceBucketChallenge and nonprofits like The ALS Association. Those that question the legitimacy of the #IceBucketChallenge and the disease are missing the point. I think that Frates worded it perfectly — to raise money there must first be awareness. While dumping water on your head and posting a video of it may seem trivial, it does work. What has this awareness translated into? From July 29 to August 18, The ALS Association received $15.6 million in donations, compared to the $1.8 million they raised during the same time period last year. Not to mention the Association has acquired 307,598 new donors. This goes to show that even a challenge and a #hashtag can have a tremendous impact. These numbers also prove that social conversations can motivate people to take real action. Critics like to argue that social media advocacy is ineffective and serves the ego of the “slacktivst,” who is unmotivated to take any real action simply because they have liked or shared a cause. If the Ice Bucket Challenge teaches us anything, it is that an effective call to action can move people to do more than simply like a video or Facebook status. The Ice Bucket Challenge reinforces some recent findings that we shared in a post where we asked, Is There More to Slacktavism Than a Facebook Like? An academic paper at the University at Buffalo and Arizona State University introduced what they refer to as The Social Media Effect. Researchers explain that online donations are not driven by the size of the organization or its efficiency, but by the size of its social network. The research suggests that “armchair activists” could play a large role in recruiting volunteers, event participants and accruing online donations. This suggests that slacktivism in the form of friends or followers could boost online donations. In relation to the Ice Bucket Challenge, this effect would be amplified because every person who participates in the campaign is leveraging his or her individual social networks, challenging three more people who then challenge three more people, and dramatically increase overall reach. Also, the campaign’s effectiveness also goes beyond just donations. The power of social media has connected numerous people within the ALS community – those who are battling the disease and their families. These people now have a network of peers to lean on and communicate with while they are experiencing the unimaginable. Social media is creating important conversations that have the potential to continue for years. Whether you are a fan or not, the Ice Bucket Challenge isn’t showing signs of slowing down. Videos are still taking over my Facebook feed and celebrities like Ben Affleck are creating buzz by accepting the challenge. To learn more about ALS and how it affects thousands of families, head over to the Palko Family. Gabriella, who posted the video of her and her father, wrote a post about why the Ice Bucket Challenge matters. 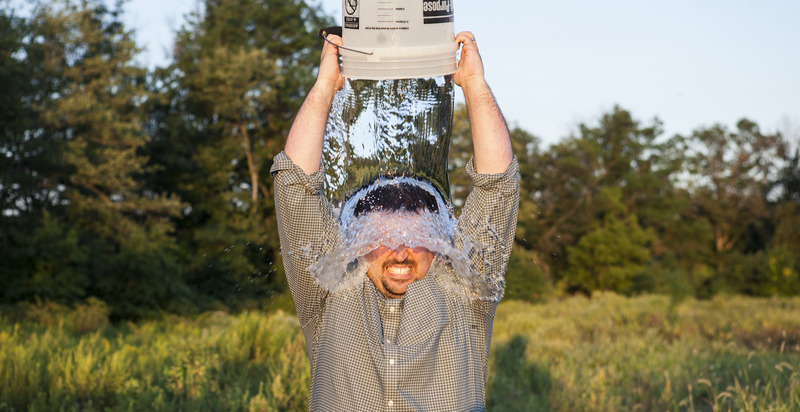 Editor’s Note: The Ice Bucket Challenge was the topic of this week’s #fundchat. Follow the hashtag on Twitter to check out the conversation. Our Director of Customer Service, Marshall Peden, started a fundraising page to support one of our #CLASSYClients, Project ALS! Donate here and help him reach his $500 goal! What's Wrong with the #IceBucketChallenge?